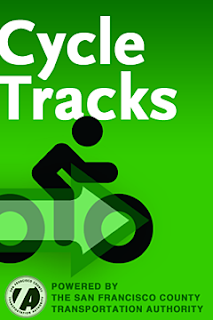 The San Francisco County Transportation Authority has developed an iPhone application that allows planners to track the movement of bicycles using the bicyclists iPhone GPS capability. Dubbed Cycle Tracks (not to be confused with a protected bike lane) the application collects real-time bicycle-use data. Planners will use the information to improve the bicycle-use component of their computer travel model, to better predict where cyclists will ride and how land developments and transportation infrastructure will affect cycling in the city. Such software could be very useful to prioritize bicycle planning here. Which routes do you improve first? The only limitation of course is demographics, only people who can afford the $60 a month usage fee for the $99-199 iPhone can be tracked. But it is a big step in the right direction.